Specialized application systems have found their way into all areas of the company. This involves storing various information objects such as customers, business partners, orders, master data, etc. These information objects very often have the same characteristics. Sometimes even the same data is stored in different systems. This often results in inconsistencies due to different data being allocated to the same business object in different systems (e.g. customer delivery address). These data sets require manual corrections. Data records need to be captured several times, which increases consequential costs. Establishing consistent information architecture in the company usually involves three objectives. In this scenario, it is determined which system is the “master” for which data. Continuous synchronization between all systems ensures that the right data is available everywhere. Supplementing the system landscape with a central “master” system (e.g. a database), in which all data is stored, creates a so-called single point of truth or data hub. This is a central point where all data is correct. All other systems receive their data from this centralized system and, in turn, relay authorized changes to this system. Consolidating data and building consistent information architecture help to reduce manual processing effort of correcting inconsistent data to a minimum, and thus to avoid extra cost due to data duplication. The general improvement in data quality also has a positive effect on business processes. We will be happy to advise which way is the right one for your company. Streamlining of inventory data is a crucial step on the way to Master Data Management. In this case, we work with different partners who use various approaches to ensure the desired data quality. 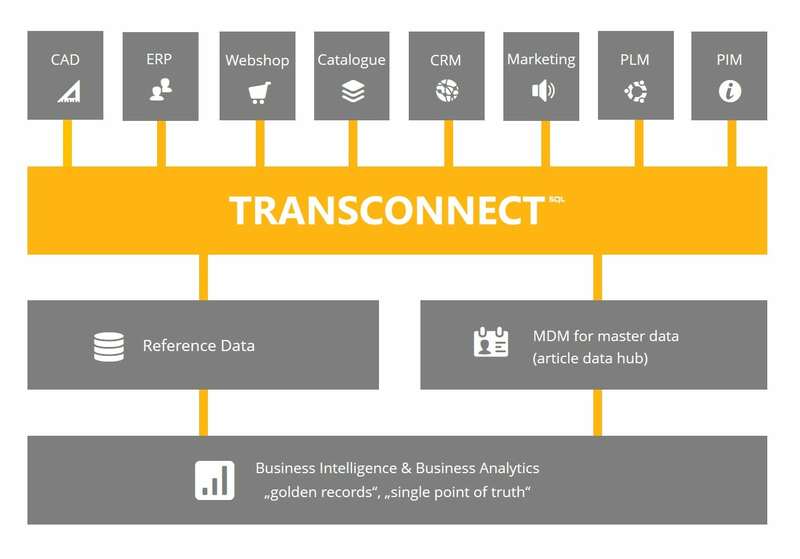 TRANSCONNECT® then ensures that the achieved quality will last.